I jumped up and down when this book was announced at the Youth Media Awards press conference — after the initial “WHAT? Really? A picture book text?” Then, it was, “YAY! Finally. A real picture book has won the Newbery!” Great job. Committee! However, it was not until today, when I finally re-read the text, blocking out all the illustrations, just paying attention to the rhythm, the word choices, the imagery, the heart and soul of this seemingly simple text for the very young that I realized how marvelous a choice this book is for the award. By recognizing the text, which allows for so much imagination and chances of deep discussions, especially literary ones, the Newbery Committee has affirmed the significant value of finely crafted text for young children. I can still recite many passages from Margaret Wise Brown’s The Important Book because I read that book to my daughter when she was still in her crib. Every night, for months, and no matter how many times I read it aloud, I found myself admiring the genius writing page after page. I am quite certain that the reason my daughter appreciates poetry and what she calls “good writing” in the adult books she reads now that she’s 16 is her wide exposure to excellent texts like The Important Book, So Said the Little Monkeys, Chicka Chicka Boom Boom, Madeline, and many others. I am ordering copies of Last Stop on Market Street for my Middle School Library and will encourage middle grade teachers to use the book to inspire students to interpret the text as they envision in their mind. CJ could be anyone. Nana could be anyone’s grandma. The boys on the bus with something CJ envies do not have to share ear-buds on their iPod and the imagery of the large tree “drinking through a straw” was never depicted literally in the illustration anyway. The students in a language arts class will simply bask in the glory of the text like “The outside air smelled like freedom,” and “rain, which freckled CJ’s shirt” and have a rigorous mental workout to understand the implied interactions and emotions. And ample discussion opportunities for the ending, when Nana does not give her usual deep laugh… now what is that all about? De La Peña sure wrote a distinguished book! A fun and funny romp into the land of wild imagination with a warm, Where the Wild Things Are ending. The father-children relationship is full of heart, too. I can see it being read aloud in many classrooms as a way to insert entertaining moments during a stressful day. This title appears to be a fairly straightforward translation/retelling of the original text found in an old Chinese book. In the foreword, Louie states that the story can be traced back to 850 A.D., in the Tang Dynasty. This is widely regarded by the western and Chinese folklorists as accurate. Although the actual 9th century text seems to be forever lost and the current tale was copied and compiled much later, in the 17th century. The story of Yeh-Shen is in volume one of the Appended text. The original text’s standard English title is You Yang Za Zu — Columbia University’s East Asian library rare book collection owns two editions of the 19th century reprints. 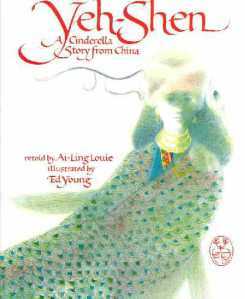 Even if this tale was originally recorded in the 9th century, whether it is the “original Cinderella story of the world” is still up for much debate in the academic world. I found a source that collects many different theories (unfortunately, all in Chinese) and one of the revelation is that Yeh-shen is a highly unusual name for a Chinese girl and it shares similar sound to the word “Aschen” which means ash, and Aschenputtel is the original Grimms fairy tale title for the better known Cinderella. This seems to indicate to some scholars that Yeh-shen was a retelling of a Western story, brought over to south west China by Arabic traders or via current day Vietnam. The step-mother and step-sister were shortly afterwards struck by flying stones, and died. The cave people were sorry for them and buried them in a stone-pit, which was called the Tomb of the Distressed Women. The men of the cave made mating-offerings there; any girl they prayed for there, they got. The king if T’o-han, when he got back to his kingdom made Yeh-hsien his chief wife. The first year the king was very greedy and by his prayers to the fish-bones got treasures and jade without limit. Next year, there was no response, so the king buried the fish-bones on the sea-shore. He covered them with a hundred bushels of pearls and bordered them with gold. Later there was a mutiny of some soldiers who had been conscripted and their general opened (the hiding-place) in order to make better provision for his army. One night they (the bones) were washed away by the tide. Cave: The Chinese word for Cave, DONG, could have meant also a small village. It seems that the Cave People might have been Villagers. Evidence of such terminology is prevalent in Korea today. Supposedly, the southern tribe in where Yeh-Shen came from was probably Zhuang Zu (壮族） — from the modern Guang Xi province. 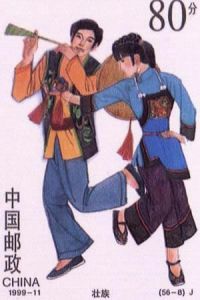 This image from a Chinese stamp shows the traditional outfits which echo Ed Young’s illustration. It is important to keep in mind that this is a minority group and the traditional costume is not the same as the majority, Han, group. This is a fantastic offer from a truly creative mind, and I believe also, from a team of designers and editors who put in so much in carrying out all the ideas: from the nibbled cover and pages, to the flip-the-flap effects, to the completely black page (yes, I was fooled in thinking, ‘huh? this is the end of the book? No way…’ and found out, to my great delight, that there is still half of the book to go and plenty more of information to come!) And of course, Gravett’s talent in illustration is unparalleled! I just love that pencil, getting gnawed to a stub bit by bit. I love the page where all the feathers “have eyes” and “sharp teeth.” I love the page with the newspaper clipping about the farmer’s wife and the three mouse tails. I love the page with the fold-out map of the Isle of Fright. Actually.. I think I simply love all the pages, each for a different reason. Even though I knew from page 2 that this is a little story on the power of books and libraries, and that this young boy narrator will become a reader in the end, I did not feel disappointed when all the prediction came true. This is due to the artistry of both the author and the illustrator. Henson’s text is folksy and true, with a wonderful lilting pace, while Small’s illustrations are gentle but at the same time with a quiet but majestic integrity. Of course, being a librarian, I am completely won over. (Just so you know, I am usually very suspicious of books glorifying Library Services and Librarians — oftentimes, I find those “books and reading are GREAT stories” corny and cringe-inducing.) I hope that others who are not in our profession will also find this fact-based story completely winning. This makes a great holiday gift for any child who enjoys this topic. The general and specific notes on various types, their usages, their histories, and those who used such and such swords are easy to read and absorb. But one definitely doesn’t need to read all the text to enjoy the book. I am so happy of this book’s existence!